So you think you’re ready to rebrand. You have a good reason (if you’re not sure, here are 7 reasons to consider one), you’ve talked to leadership, you’ve done the research, and now you’re ready to hit the road running. You may be eager to dive into logo prototypes or word clouds, but a good rebrand generally requires an intentional and meticulous process. For a huge global company, it can take years, millions of dollars (as Pepsi’s did), and an enormous team of interdisciplinary creative professionals. While it can be less complex and costly for a mid-size company or startup, it’s still a detailed process. You can’t just give a designer carte blanche or tell an agency you want something “young and fresh,” then expect the right idea to roll in. A good rebrand doesn’t start by fast-forwarding to the future; it starts with taking a look at your present brand. You can’t create a strong vision without an intimate understanding of what it is you’re working with, the struggles your brand has faced, where it has failed, how you want it to evolve, and what you hope it will achieve. That’s why a rebrand should always start with a brand audit. We often end up walking our partners through this process, but if you can get a jump on it, it will save valuable time for everyone involved. Here, we’ll walk you through a brand audit, including the questions to ask, pulled from the framework we use ourselves. Answer everything as thoroughly and honestly as you can. Gather insights and feedback from individuals at all levels of your organization, not just the higher-ups. This way everyone can rest easy knowing that the information you’re working with is current and accurate. So, onto the exercise. Here are the basic survey questions to distribute to your team. You may add, edit, or tweak depending on what’s most relevant to your brand. What does your organization do? Use a succinct, objective description. What is your core identity? This includes purpose, vision, mission, and values. 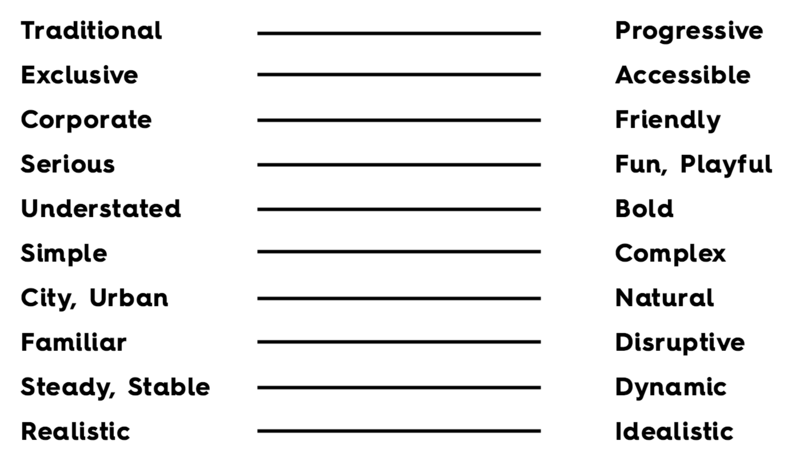 Exercise: Place an X where you want your brand to fall on the spectrum below. Where will this logo be used (print, web, social)? Should your new logo be “evolutionary” or “revolutionary”? Is it updating the current identity or starting completely new? What is your brand positioning? Articulate what differentiates you in the marketplace, or how you are different from your competitors. A simple template to help you articulate this is “Our [offering] is the only [category] that [benefit]. What is your value proposition? What benefits can consumers can expect from your brand? If you need to rework yours, follow this simple guide to writing a great value proposition. What is your tagline? Use a simple, succinct statement summarizing your brand promise. What’s your elevator pitch? Sum up what you do in a few sentences. What are your brand stories/messaging? These are main talking points/supporting messaging that reinforce your value proposition. What is your voice/tone? How do you speak? Who is your brand persona? It can be helpful to describe your brand as a person, such as George Clooney with the irreverent humor of Jon Stewart. Your job is not to gather surveys, then dump the pile on your poor design team or branding agency. The goal of the exercise is to get a consensus and distill your thoughts into a single, all-encompassing document. After you’ve talked it out, your team should be able to fill out a single “official” questionnaire (which will ultimately become the outline of your creative brief), then you can share it with whoever is helping with your rebrand. If done well, this document will help make your rebrand stronger and more successful from the get-go.